Hitch’s sprawling cross-country epic adventure has never been one of my favourites. Perhaps it was the overly preposterous maguffin plotting, or the extensive and often distracting overuse of his rear projection process shots, or its length (it was Hitchcock’s longest running time, clocking in at 2 hours 15 minutes). But on Blu-ray it’s a completely different experience, a pristine and stunning high-definition presentation, which makes the entire picture larger than life and as close as ever to the big screen, immersive theatrical experience. The story behind the making of the film, which is revealed to us in the beautifully designed Warner Bros liner notes, indeed stemmed from Hitchcock’s desire simply to make his biggest movie to date - a disposable action picture bereft of the psychological layers he previously dug himself into in Vertigo or would go on to do in his subsequent effort, Psycho. North by Northwest is breezy entertainment to say the least. The plotting is fantastical and paper-thin at best. Cary Grant plays Roger Thornhill, a NYC ad exec (think Don Draper with a sense of humour) who randomly gets pulled into a cab by a couple of thugs carrying guns who claim he's a CIA spy named George Kaplan. When Thornhill escapes the clutches of the baddies he finds himself on the run, a journey which takes him by plane, train and automobile from NYC to Chicago to Indiana to South Dakota trying to clear his name. When he inadvertently gets a murder rap pinned on him, he’s made a fugitive from the law, as well as the suited heavies. With no one to trust, he finds himself helped by a mysterious femme fatal blondie, Eve Kendell (Eve Marie Saint), who uses her sexual powers to seduce Roger and then double-cross him back into the clutches of the spies. Thornhill finds trouble and adventure in a number of wild situations, including the UN building, Grand Central Station, the streets of Chicago, the prairies of Indiana and finally, and most famously, Mount Rushmore. Despite the danger, Hitchcock never lets Thornhill take the situation too seriously. His ability to take the piss out of anyone and any tense situation adds a typically Hitchcockian and British wry comedic tone. All the other hallmarks of Hitchcock’s style are heightened. The film works best as series of set pieces, all of which are impeccably choreographed to maximum suspense. The crop dusting scene is still one of his best ever directed sequences. 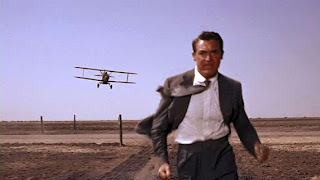 As Thornhill stands alone at the desolate crossroads, even before the plane strikes, Hitch teases us with the sound of the bi-plane humming in the background. He misdirects us away from the plane by having Thornhill converse with a waiting bus passenger on the road. And when Hitchcock decides to have the plane strike at him, his use of composition and editing creates teeth-shattering tension and danger. Though the scene takes place in the wide open and in bright daylight, it's made frightening by the isolation of Thornhill in the expansiveness of the environment. This is a consistent theme throughout. In every scene Hitchcock is conscious of the placement of his characters in space and architecture. The UN scene is a good example. His wide shots frame in the high ceilings and lengthy staircases of the interior design, and the final magnificent exterior overhead shot of the building, which shows Thornhill leaving in a cab, is framed to shrink the character against his surroundings. This is the entire purpose of the Rushmore sequence, his characters having their final confrontation on a mountain sculpted into four massive heads in the rock. North by Northwest is not perfect. The third act resolution in South Dakota is long and takes too much time trying to explain the narrative jumps it took to tease us for the previous two acts. We’re also left without much to resonate with. The final phallic train shot entering the tunnel is subliminally clever and cheeky but is also as eye rolling as James Bond double-entendres. I used to have a major problem with Hitchcock’s insistence on cheating studio interiors for exteriors, even into the late '50s when on-location shooting was common in Hollywood. Hitchcock even places his characters on hideous studio-confining treadmills against pre-recorded backdrops to do exterior walk and talks. But under the high definition Blu-ray treatment these scenes blend in better than they ever looked on VHS or DVD.